Do you want to improve the functionality and appeal of your outdoors? Do you want to have a new outdoor living space where you can cook your favorite dishes and dine with your family and friends? Then call From the Ground Up. 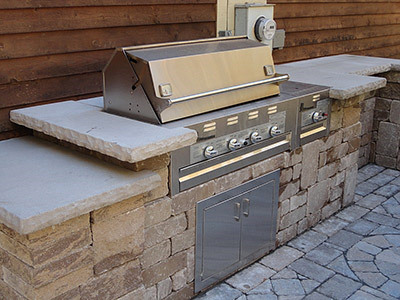 We can build a custom outdoor kitchen in your property at a cost that won't put a hole in your pockets. We have more than two decades of experience in landscape construction and property improvement, so we know the right features to include in your new outdoor living space. The outdoor kitchens that we have built for countless clients in Rutland and surrounding areas are known for their excellent construction and unique style. We urge you to contact us today so we can show you some of our completed projects. You can dial (802) 775-1436 now or visit us at our office during your most convenient time. At From the Ground Up, you will get custom-designed outdoor kitchens courtesy of our seasoned outdoor living designers. Our design team will sit down with you to get your ideas and design preferences. With the vital information that you will provide, we can come up with kitchen styles that will suit your needs and design taste. We are confident that you will be more than satisfied with the design plans that we will present to you for approval. We've already created gorgeous kitchen designs for our previous clients, and they commend us for our ability to realize their dream outdoor kitchen setup. The beauty and functionality of your outdoor kitchen depend on the installed features and amenities. Here at From the Ground Up, we carefully choose the feature and amenity that we include in the kitchen design plan. We make sure that these features satisfy your needs and preferences. We also consider other important factors such as the specific location, size, and intended use of the kitchen. If you want to use this area for weekend get-togethers with family and friends, then a large kitchen setup is recommended. You might also need a fully furnished kitchen complete with dining tables and chairs. Meanwhile, a small kitchen island with BBQ grill will be perfect for fun cookouts with your loved ones.